Residents from two villages in Okinawa, Japan, are filing a lawsuit against the government to halt the construction of US military helipads, citing noise, crime and pollution. The pads, built at a distant training area, will be used to move and consolidate America’s position in Okinawa, and cede control of earlier-held areas back to Japan. According to reports, 31 of the 33 plaintiffs hail from the Takae group of Higashi village, with others coming from the Kunigami and Aha villages. The Japanese Defense Ministry says that Aha and Kunigami are both close to helipads constructed in 2014 and given to the US military a year later. Yukine Ashimine, a 45-year-old Takae resident, told Stripes.com, "If and when all of [helicopter landing zones] are completed, this entire community of 150 residents will become unlivable." She said that the helicopters scare her family and make her house shake, adding, "Ospreys fly so low over our home every day until almost 11 at night." The Japanese government maintains that helipad construction will benefit Okinawa, as it will replace land returned by the US from the Northern Training Area, the largest transaction of its kind since 1972. Ikuko Isa, 55, another Takae resident told the Japan Times last week "Osprey aircraft fly around the community once an exercise starts and their low-altitude flights shake our buildings." Protesters at the helipad construction site and in Tokyo have been met with riot police. One demonstration in July saw police descend on the protesters, outnumbering them five to one. Opposition escalated recently following Tokyo’s attempt to restart construction. 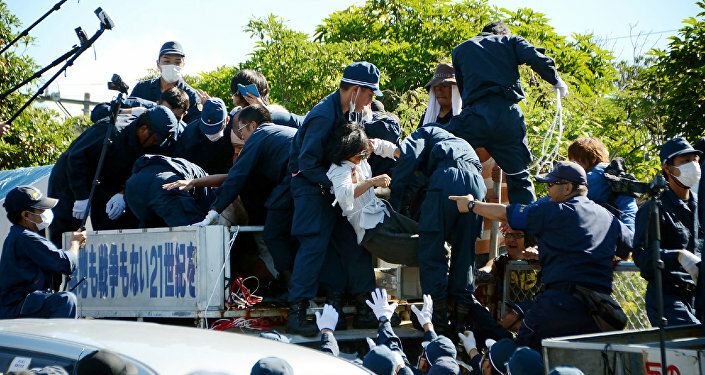 "It's been 71 years since the war ended and America is still occupying large parts of Okinawa, freely roaming around Okinawa's skies and waters," said Keiko Itokazu, a lawmaker born in Okinawa, quoted by Military.com. "Okinawa is not treated as an equal of the rest of Japan."